“The Essential Principles of Climate Science” presents important information for individuals and communities to understand Earth’s climate, impacts of climate change, and approaches for adapting and mitigating change. Principles in the guide can serve as discussion starters or launching points for scientific inquiry. The guide can also serve educators who teach climate science as part of their science curricula. The publication warns that the UN negotiations aimed at tackling climate change are based on substantial underestimates of what it will cost to adapt to its impacts. The real costs of adaptation are likely to be 2-3 times greater than estimates made by the UN Framework Convention on Climate Change (UNFCCC). On the past 27th of August, CoastNet presented the IMCORE project at the Coastal Initiative for the East of England Board Meeting. Attending to this meetiong were representatives from the Environment Agency, EEDA, Natural England, GO-East, Norfolk County Council, English Partnerships, Suffolk Coastal District Council, English Partnerships, Sustainability East and CoastNet. 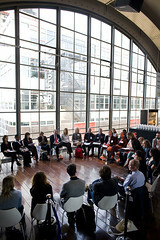 An innovative idea of an “Ecosystem Framework Directive” has been explored by An Cliquet and other authors from Gent University, one of our IMCORE partners. The article considers this idea as an option to research after analyzing EU nature conservation policies and the scientific challenges we are facing to deal with adaptation to climate change in protected areas. To see this article you can view abstract or download pdf here. Our partners of the Maritime Institute, University of Ghent and MOW Vlaanderen together with UCC and MACE – Cardiff University have done an excellent job in hosting and organising our second Progress Meeting & Partner Scenario Methodology Workshop the 12th and 13th this month. We have had an interesting overview of what is happening at a local level with our Expert Couplets from Belgium, UK, Ireland and France. We appreciated a comprehensive summary of the international framework of Adaptation for Climate Change that was presented to us by UCC. Our field trip to Oostend included presentations from various organisations that work on different aspects of Coastal Management in Belgium. 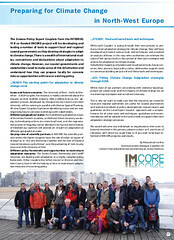 See a photograph of the IMCORE group here. If you pass the mouse over the image you can see who is who!